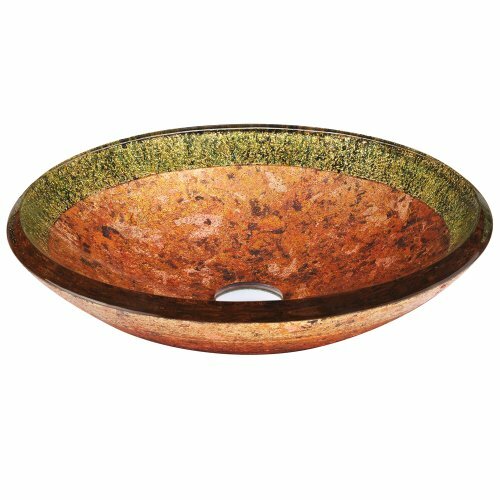 This VIGO sink combines vintage styling with modern design, featuring a multicolor surrounded by sparkling green tones. Handcrafted with possible unique and slight color variations so no two sinks are identical. Each sink is a dynamic work of art that complements any style bathroom. With its scratch resistant glass and non-porous surface fading and discoloration is a thing of the past. Pair it with a sleek VIGO Vessel faucet or Matching Waterfall faucet to create the complete look. VIGO VG07000 pop-up drain assembly and mounting ring sold separately. Diameter: 18-in., Height: 5-in., Glass thickness: .75-in.